Well, Reina is finally (FINALLY) graduating and while most people are sad about it, I am, of course…not. I AM SUPERAWESOMEMAASASTYLEHAPPYPANTS!!!!!!! But despite the happy, I can’t deny that this is one of those moments, like when Takahashi left, when it feels like an era is ending. I forget that Winky has been winking for nine years now. I grit my teeth when I write this, but even I must admit that she’s been integral to the group. Even if I can’t think of how, many people fell in love with her over the years. 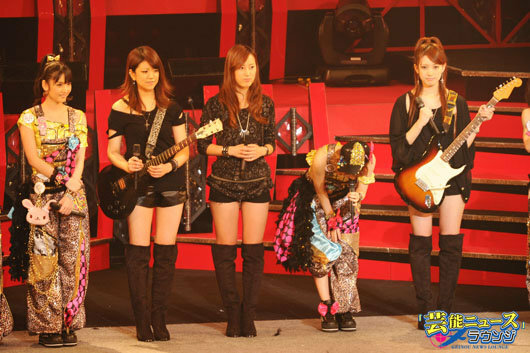 With Momusu going into their fifteenth year (!!! ), they seem to already be cementing this vocaloid-y, techno-ish new sound. How will they move forward!!? I have some things I’ve been thinking about. I called it, didn’t I? The moment I read about her little BAND adventure, I said, after I’d stopped laughing really loudly, that this was probably her avenue to GTFO of Morning Musume. FINALLY. Lo and Behold: we have band members and we have a grad announcement.